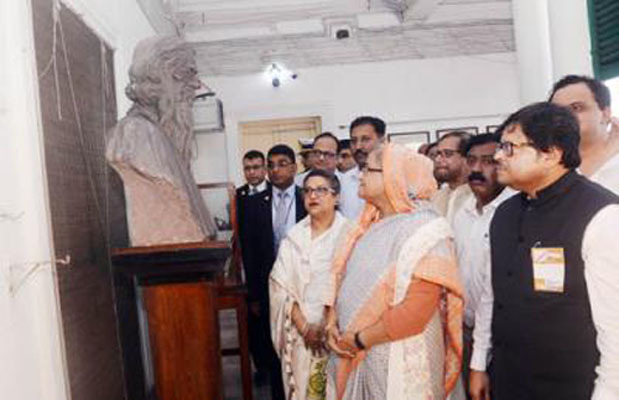 PM visits "Jorasanko Thakur Bari"
Prime Minister Sheikh Hasina visited "Jorasanko Thakur Bari", the residence of Biswa Kobi Rabindranath Tagore, in Kolkata on Friday afternoon. The premier went round different rooms of the Thakur Bari located at Rabindra Sarani, Singhi Bagan, north of Kolkata. It is the house in which the Nobel laureate poet Rabindranath Tagore was born on May 7 in 1861, spent most of his childhood and died on August 7 in 1941. Later, the premier signed the guest book. Sheikh Hasina arrived Kolkata this morning on a two-day official visit to India at the invitation of Indian Premier Narendra Modi.